What is a cinematic artist? Bring players into the game! Cinematics are one of the most effective ways to draw players into a game’s world. Not only do they directly introduce players to the game’s storyline, they also convey joy and excitement, tension and inspiration. As a cinematic artist, you’ll help create the cutscenes that bring players into our games and keep them there. Modern technology lets us make the most lifelike, high-quality cutscenes ever seen. Considerable advancements have been made in camera animation, character animation, facial animation, and lighting – but this wide-ranging technology needs your capable, creative hand to direct it to create something truly special. 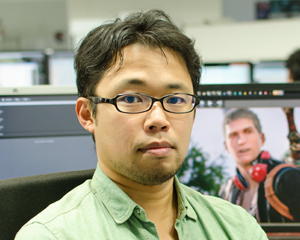 When we create demo scenes at PlatinumGames, we typically give one artist full control of the process, from CG creation all the way to implementing the scene in the actual game engine. As such, our cinematic artists keep their hands on every element of their scene, from the camera and character animation to the lighting and filters. The process begins when our cinematic artists receive scripts for their scene, either from within our company or outside writers. Next, cinematic artists lay the groundwork for CG work or motion capture filming. The overall staging of each cinematic is determined at this early stage, and decisions made here can have a massive impact on the efficiency of the creation process to come. Even video storyboards can be made with the cooperation of motion capture studios! We may not have our own motion capture studio here at PlatinumGames, but we’ve cooperated with many talented studios to meet our needs. Cinematic artists prepare specifications and meet with these studios as they prepare for the day of filming – and attend the filming in person to ensure smooth communication and get the best footage possible. Environments, character models and motion capture data are all combined to compose the scene. Most of our cinematic artists’ work involves using CG animation tools to animate characters, faces and camera movements. They edit the video to suit the script as they see fit, determine the length of each camera cut, and generally work in their own style to create a captivating cutscene based on their storyboards. Within the field of cinematic artistry, there are further positions for facial animation specialists. These specialists are dedicated to bringing our characters’ faces to life, from rigging to animation. Lastly, cinematics are exported to the actual game engine, where we use our in-house tools to adjust lightning and filters to get them Platinum perfect. After that, the VFX and audio teams take over most of the work. Effective cinematic artists are able to convey their design intentions to members of each team – communication is a very important part of the job. In addition to the duties outlined above, our cinematic artists are encouraged to actively participate in storyboarding and scriptwriting for our games. I went to work for an animation company right after I graduated college, but soon found that I wanted to work somewhere where I could make better use of everything I’d learned. I found that in the games industry. How does PlatinumGames differ from your previous job? The most notable difference is that, at PlatinumGames, anyone can make their ideas and opinions known. In fact, speaking up isn’t just allowed – it’s required! Of course, just because you give your opinion doesn’t mean that it’ll be reflected exactly as you imagined, but having your voice heard makes the creative process at PlatinumGames very fulfilling. Please tell us something about your work creating cutscenes. Well, as it says in the job description, working as a cinematic artist involves animating cameras and characters, adjusting lighting, filters and so on. We take a really hands-on approach to creating cutscenes. It’s a job that’ll satisfy anyone with an interest in composing and structuring a scene. Being given full responsibility for every aspect of a scene makes for hard work, but the opportunity to put your own personal touch into the game comes with it. Finishing off a scene makes me feel really accomplished. Please tell us about what facial animation specialists do. Facial animation specialists create and manage custom facial rigs and animations for each of our games. As each project’s needs may differ greatly, facial specialists in particular need to stay on top of the latest modeling techniques and development tools, and maintain a wide base of knowledge. Facial movements are what really breathe life into a character. Facial animators have to be very particular to ensure that characters’ animations make them look charming and lifelike. It’s a lot of pressure, but that makes it all the more fulfilling to see a character express themselves through your animations. What makes PlatinumGames appealing to you? There are no barriers – physical or metaphorical – between the teams that make up our development staff. It’s easy to share your opinions with members of other teams as we all strive to make the best games we can. What would you tell someone who’s considering applying to PlatinumGames? If you’re looking to help create something great, and to have your own input valued and reflected in the final product, PlatinumGames has the work environment you’re looking for. Applicants with an interest in cinematography and the presentation of films and stage plays. CG animation and cutscene creation experience is preferred, but not required.